On this week’s episode of the Marketing Evangelist Network, LeadMD CMO, Andrea Lechner-Becker, welcomes Amanda Wolff to the show. 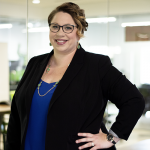 After working in sales and marketing for the last 20 years, Amanda recently made the move to work for a start-up called OneSpace as their new CMO. Listen in as she shares her tips and tricks of marketing along with her passion for ABM and how working at a start-up has changed her career. 00:52 – Tell us a little bit about yourself and OneSpace? 01:47 – Talk to me a little bit about what you love about Account Based Marketing and or how it came into your nucleus as something you should be focused on? 06:11 – You have a friend, they were a VP of Marketing at a really big company, and now they’re going to be CMO of a startup. What would you tell them? 12:05– You come into a smaller organization – how do you assess what they’re doing and then start to formulate your plan for what they really should be doing? 21:27 – I’m always really curious, how do you decide what to just pick up and move forward versus really saying, “Hey, I can’t really do this without this position, I need you to hire it for me,” or do you do a little bit of both? How do you manage those sorts of things? 24:54 – Did you do an exercise to re-figure out your total addressable market, or did you had confidence in what you came into? 29:39– We pick our TAM (Total Addressable Market); next, there are lots of different ways that sales teams can pick their actual targets. Then we start our campaigning, right? 34:48– How do sales reps even know what to say? Because that buying process is so different….to your point, even the idea of having GE. GE is not a company, GE is thousands of companies, right? 36:36 – How did you get familiar with the buyers? 40:51– Do you have any hard results yet for these ABM efforts? 42:52– You work for a really data forward company, and we’re consultants…we love data, it’s important, it’s great. What role, if any, do you feel that gut still has? 47:03 – Let’s take the cost of a platform like Marketo, where does that fit in? How do I split that among all of my channels that are leveraging Marketo, and where do you start and stop in that conversation? 49:53 – Where do we learn more about what you guys do and what you’re up to? Set realistic expectations for yourself. Always aim high and set goals that will push you as a marketer, but always remain realistic about what is actually feasible and what you can actually accomplish in your timeframe. Building relationships is essential. You can always achieve success in a new position, but you cannot do it alone. Building a positive relationship from the start leads to more success at a quicker rate! Partnerships are important for ALL marketers. Know your partners, build good relationships and nurture them. This is the best hack to being successful and learning about your industry off the bat! Andrea: Hi, welcome to Marketing Evangelist Network. The show where we talked to great marketing leaders, about smart marketing stuff. I’m Andrea. I am CMO at LeadMD, and my guest today is the wonderful, fantastic, brilliant, I don’t know other acronyms that means smart, Amanda Wolff. Two F’s. Andrea: Two F’s no E. She is CMO over at a company called OneSpace. Amanda, welcome. Amanda: Thank you. Thanks for having me. What is OneSpace? Tell us a little about yourself! Andrea: Tell us a little bit about you and about OneSpace, and your role, and your history and the whole thing. Amanda: Sure. I’ve been in marketing and sales for over 20 years. I spent the bulk of my career at a really large multinational company called Elsevier, it’s a publisher and moved into OneSpace about 10 months ago or so. OneSpace is a software and digital marketing company. We help consumer packaged goods companies, the really large guys out there, optimize their product content on online retailers like Amazon and walmart.com and places like that. What is it that you love about Account Based Marketing? Andrea: One of the things that intrigues me the most about you and your skill set and just your current passion, I think, is ABM in general. Can you just set the stage for, well, I assume you haven’t always been ABM focused marketer, but maybe that is untrue? Talk to me a little bit about what you love about Account Based Marketing or how it came into your nucleus as something you should be focused on. Amanda: Sure. I’ve run ABM now at two different companies, very different actually. The first company where we started exploring ABM, it was really with an addition mindset. We were looking at adding it into the mix but still focusing on more traditional B2B activities. OneSpace – where I am now, it’s a smaller company, we focused on enterprise accounts, Fortune 500’s, so there’s very finite audience out there for us, so it lends itself to a true ABM program. I came from a copywriting background and a creative background, so I spent much of my time in the last 20 plus years in the profession, doing everything from old school direct mail to moving into email, and then overkilling it with that and then moving into events. It’s been the full offline, online or omnichannel approach. What was your marketing experience at your last position like? Andrea: Got it and so your previous company for 17 years, that was a gargantuan kind of company, right? Andrea: What size are we talking about from a marketing team perspective? Amanda: I would say roughly about 40 people on my team, so pretty good size. That was just the division that I focused most of my career in. 30 or 40 people in that division’s team, but that was one of, I guess, about 13 marketing teams in the organization. At one point, I was in two different teams at the same time. Definitely a much larger team, than what I’ve experienced working in a startup. Andrea: Yeah, why have just one job when you can have two? I always say. Amanda: Exactly. Why don’t you throw a third in there? Andrea: Yeah, sure. I mean, what, just give me more responsibilities. I would love it. Same pay, same title, just give me more. What are some of the biggest differences you noticed in moving to a startup company? Andrea: What are those big stark differences? You go from this huge company that you’ve been at for such a long time, and you go from this feeling of, I assume, “I’m the smartest person in the room, I know our product so well. I know our customer so well,” and you go into this new role at this startup, and nothing like, talk to me about what that was like. Amanda: To say I was naive as an understatement. I was fortunate in my career in the large multinational to be on the innovation side of the business for a very long time. I was able to operate small teams like a startup where I was given a lot of trust and autonomy by my leadership, and fail fast, and fail often, so took a lot of risks. It was basically like a well-funded startup. I had the opportunity to try some really innovative things and test and learn. That ability to be able to do that small was ultimately why I would advance into the next role, and the next role there, and the next role there. Eventually, it became a much larger endeavor to be as innovative. There’s a lot more red tape the higher you get in the organization, I was able to operate under the radar. That experience of being in an innovative startup mindset, working with a lot of developers, and agile and I really felt like, “Oh, I can walk into a startup in a tech company and I should be perfectly equipped to deal with all the challenges that are thrown at me. I’m a roll up my sleeves kind of girl, I can get in there and do all the work even if I don’t have a team.” Yeah, I was completely naive, completely naive. It is very different. There are some things of course that are the same. These marketing principles, the things that we learn, the best practices that you absorb, when you soak up all the wonderful rich content marketing that we do for each other in marketing today is really great and those principles still hold true, but man talk about different environments when you go from a large team of 30 or 40 people to zero employees, as I did on the first day here. What is your advice to a friend who might be making a similar career move? Andrea: Yeah, so what would your advice be? You have a friend, they were a VP of Marketing at a really big company, and now they’re going to go be CMO of a startup. What would you tell them? What do you think they should do in their first 30 days, maybe their first 90 days, whatever timeframe is feasible? Amanda: Well, I think one piece of advice would be to be prepared for a culture shock. Walking into an open floor plan when you don’t, when you’ve had a big office and you would have meetings in your office with your team members and then you go into the open floor plan and you’re shown to your workstation, it’s a culture shock. I was a brat I’m not going to lie. I was used to having somebody schedule my meetings for me, and someone do my expense reports, those days are behind me and I realize now how spoiled I was by that. I mean truly spoiled. In all seriousness, though, I think if I were to make some recommendations to someone stepping in to the startup environment, especially in a 30, 60, 90-day approach, as a marketing leader, I would say that it’s really important to set realistic expectations about what you’re going to be able to accomplish. Not just with your leadership, but also with yourself and with all of the stakeholders on the ground. That would be one key thing that I would emphasize. I think the other is to take some time to really learn more about the culture and to learn what you need to in order to get buy-in and to get the momentum that you need to get something done. The reason I say that is that in the previous organization that I was in, I could move really fast because I had a team that was firing on all cylinders that trusted me, and that I trusted. While I had a larger team and I moved to a startup where I didn’t, I think I still thought that I could push at the same pace, not really realizing how much ramp-up time I would need to get the rest of the organization to come along with me. I think setting ambitious goals in a startup environment, there’s a culture for that, especially in a startup where you want to move fast and you want to be able to be effective quickly and demonstrate success. You don’t have a year of build time, you don’t have 18 months of build time, you need to be able to demonstrate results in six months or less. The flip side of that is that if you move too fast, or over commit to what you’re going to be able to accomplish, then it’s just a detriment and it sets you further back than if you bit off what you could do and accomplish things at a reasonable pace. Andrea: Yeah. I love that advice. My advice is pretty similar. I always encourage people to focus on people immediately. Because to your point, when you’ve been someplace 17 years, you’ve established that relationship and it probably doesn’t occur to you how hard that was. Because it’s so far, it’s so long ago like it doesn’t matter. But I do, I see that all of the time with new CMO’s and in leadership positions because the truth is you can’t get anything done by yourself. Nobody’s just going to give you a blank check, and you hire all the sales people, you figure out how to do accounting. You have to work with these other major stakeholders throughout the organization to get things done. I find all the time that CMO’s are too gung-ho to start, “I’m going to change this and I’m going to do this,” and it’s like just focus on the people. You get so much done if you are an internal marketer first. Here’s my vision. Here’s what I think. What do you think? Pull people into you and your plan. Why is building relationships so critical? Andrea: It’s so important and it is really hard to do and your advice to set that expectation with your boss who I’m assuming, the CEO is so important. My first 30 days, you weren’t going to see anything from me. I’m going to shock you right now. All I’m going to do is build relationships because I can’t do this by myself. I need the people who are already employed by you to help me. I love, love, love that advice. Amanda: I think the other piece that I would say might be surprising to someone who’s coming from enterprise, and moving into startup, is the level of interaction with marketing and involvement, and interest in what you’re doing in the startup environment compared to enterprise. In enterprise shockingly I think people tend to stay in their lanes. The lanes are very clearly defined. Marketing does this and you’ve had 30 years to demonstrate what marketing should be doing, and what sales should be doing, and what product teams should be doing. And I think in the startup environment, those lines aren’t as crisp, and so they tend to bleed. I think some of that could be very different depending on the culture of the startup that you’re talking about. I would say, don’t be surprised if sales really wants to know about every email that you’re going to create, or if product really wants a lot of regular updates on what marketing is going to do. It’s that’s not something that I had expected and something that was a change for me and ties in even more importantly to the point you made, about the essential nature of building relationships in those first 30 days. What are the differences you felt between being a CMO and a marketing leader? Andrea: We talked a lot about the difference between being a CMO, and a marketing leader at a big organization versus a small organization. Talk to me a little bit about what it was like, right? You come into this smaller organization, they’re doing stuff, like, how do you assess what they’re doing and then start to formulate your plan for what they really should be doing? Shockingly, I think it was all of the above are wrong. I was wrong on all counts. The company is like a lot of startups, is a digitally native organization. Very, very comfortable with analytics and being data-driven, they’re progressive, they were doing a lot of content marketing. But it didn’t take long to spend some time lifting the hood and really evaluating the campaigns themselves, as well as the strategy and the analytics behind those campaigns to see it was primarily an inbound marketing strategy. Which I think definitely still has its place and still has a time but when you’re targeting Fortune 500’s, when sales is really only going after a set list of accounts, maybe 150 accounts, but your marketing team is focused very much on getting as many leads as possible that all come to you. It was very much about inbound blogging and paid media which is as you guys probably all know, that are listening, it’s pretty expensive. It didn’t take long to start evaluating whether or not another approach might be appropriate to layer in. I didn’t anticipate that I would go Account Based Marketing exclusively, and I still would say that to some degree, I’m not doing it exclusively. Because my take on ABM is still that we’ve been doing ABM in marketing for many, many, many, many years. We just don’t call it that. We don’t necessarily have a formalized framework around it, but we’ve been going after set accounts for a very long time. We’ve been collaborating with sales for a very long time on prospects that are target accounts. In that sense, the segmentation aspect of marketing is still very much the same with ABM, but there’s so much structure around it now, and there’s so much thought leadership on it, that it allows you to implement and scale and more importantly measure in ways that we really couldn’t do 10 years ago when we were thinking about ABM. Ultimately, I decided that it may be a good strategy for us. And I would say that for this company, we’re still in process with it. It’s still in the early days, so I would not say that we have things firing on all cylinders by any means. It’s a journey and we’re just starting down that path. I do think that aligning with sales makes a lot of sense, helping them through the full sales cycle is an important aspect of what marketing can bring to the table. Ultimately, we want to add as much value as we can and help close as much business as we can with them, so that’s what we’re doing. How can you help lead your organization towards outbound lead functions? Amanda: Well, I would say that challenge number one was that the sales leader left the organization not long after I started. Not having a centralized point to really align with and partner with and instead working with every rep individually. Now there are only five reps, but all the reps have different flavors in how they approach their accounts and what they’re looking from a partnership and marketing. That made standardizing and coming up with some really consistent ABM best practices very difficult for sure. I would say establishing that relationship with your head of sales is point number one that you should try to do with an ABM program and I, unfortunately, didn’t have that luxury to do that. I think ABM sells the promise that you’re going to be able to have this really great relationship with sales. That you’re going to be helping them long after, that you’re not going to be sending them junk leads anymore, but it’s also, it is a trust factor because now you’re reaching out, you’re doing outbound, you’re doing a lot on the marketing side to engage these customers, that reps have historically done on their own in that traditional wall where marketing just kicks leads over the fence and doesn’t ever touch them again. There is a volley that’s happening, that’s back and forth and the negotiation that has to happen there. Thankfully, we have a Head of Sales now and that relationship’s going really well so I think that we’re getting some momentum on that front. But I would say some advice around that is at the organization I’m in now we read a lot of the blog posts from Tomasz Tunguz who’s kind of Guru venture capitalist guy, and I’m probably really just butchered his name … But he’s really impressive. One of his posts was around the notion that you could be in a room, and you could be talking about the exact same project. Some people are talking about it as they’re building a castle in this master grand vision for what this castle is going to be. There are other people in the room who are talking about the walls of the castle, and what these walls are going to be like, and other people are talking about the bricks. When conversations derail, it’s typically because you’re not all aligned talking about the same level of the project at the same time. Stepping back and really looking at the walls and that campaign architecture of where should these handoffs happen? In a traditional Demand Gen funnel, the top of the funnel, you’ve got your marketers, and then the line is really horizontal. I’m trying to remember where I saw this analogy recently, but they described the ABM funnel as being divided vertically down the middle where marketing and sales are passing the ball back and forth in this vertical manner all the way through the sales cycle. Andrea: I love that, yeah. Amanda: Yeah, it’s really a great analogy and I think in order to be able to do that you have to have a wall. You have to have, you can’t just talk about the bricks, you’ve got to build that wall. That’s where we’re stepping back and really looking at now are the walls. I’m hopeful that that by doing that and articulating the bricks that all three levels here that we can get alignment around the strategy, and better alignment with sales, and ultimately better relationships than you would have in a Demand Gen model. How can you spot different needs in your marketing department? Andrea: Yeah, I love that. Your sales leader leaves and you start picking up a lot of those responsibilities. Slightly off topic, I suppose, of ABM in general, but I’m always really curious, how do you decide what to just pick up and move forward versus really saying like, “Hey, like, I can’t really do this without this position, like I need you to hire it for me,” or do you do a little bit of both? How do you manage those sorts of things? Because I hear it all the time with SDR’s for example, it’s like should marketing manage them, should sales manage them? A lot of times it just feels like, “Well I kind of like got left with them because the manager quit, and then I was doing the inbound stuff so I just started giving them messaging, and then they started reporting to me somehow. I don’t really know how that happened, but it just kind of did.” Talk to me a little bit about your thoughts on this. Amanda: I think so much of it is really specific to the organizational culture that you’re working within. There are always people in the organization that you wouldn’t expect to take on the mantle when changes like that happen that wind up doing so. In the case that I was just talking about, with the head of sales leaving, the CEO had all of the sales reps reporting to her. This is a culture where she’s very active in the sales process and she took on as a thought leader in her own right, so that made a lot of sense. They had a direct reporting line but also she’s a CEO and is extremely busy. I think the more day to day, tactical aspects of sales management and sales leadership, that’s where everyone is trying to pick up the ball and figure out what to do in those cases. I think a lot of the sales reps emerged as leaders and were able to have a voice in that process. It definitely does create a challenge for a new marketer if you’re coming in the middle of a huge transition like that, not a ‘poor me’ situation by any means, by the way, I’m not holding a pity party for myself. I think that’s probably true in a lot of different organizations where you’re rapidly changing and growing in a high growth model, then you’re probably going to have people coming and going, and so that you can’t just plan to form those relationships one time and walk away to your point earlier in our conversation, you have to continue to build those relationships, to continue to form that bridge of trust with every single person on the ground if you don’t have a leader in place. How can you work to find your new Total Addressable Market (TAM)? Andrea: Yeah, I totally agree. We’ve talked a little bit about just generally how you came in and the number of accounts that you guys are working and stuff like that. Did you do, was it clear because I think one of the things that we see a lot is that people struggle to just even get started with Account Based Marketing, they conceptually understand it, of course it sounds like a good idea to your point, and so this idea of really creating your total addressable market, even I find is something you learned about if you go to school for marketing, but nobody ever really tells you how hard it’s going to be, right? Andrea: You typically hear about things in B2C functions, and so you know your trip, in that context if you’re going to sell soda to someone, you know what your total addressable market is, but in B2B business, in B2B marketing, I should say it’s really, it gets pretty complicated. Did you do an exercise to re-figure out your total addressable market or you had confidence in what you came into? Talk to me a little bit about that. Amanda: I think it’s a little bit of both ends. The company was shifting to a new focus, right as I was hired. Before the shift to an enterprise CPG focus, it was more of a lower price SaaS model, still CPG, but not as targeted at the larger Fortune 500 accounts. That process had already been started by the head of sales before I started. They had what they were considering a target account list. I think it was divided into two buckets. One where accounts that were already claimed by reps, and one was a bucket that wasn’t claimed by reps. It wasn’t, I wouldn’t say I’m really organized by tiers, there wasn’t a lot of thought into subsidiaries and how independent purchasing decisions in B2B could be made, especially in these large multinational organizations, that they may have subsidiaries with independent line items that they can pay for things on their own. That was, that process I think, had already been started, so it did give me a starting point. Working collaboratively with the sales team as a whole to try to tier those accounts where the reps at first, the reps really picked up their tiering. So we started with that account list, broke them into three tiers, prioritized and established an SOW of sorts, I guess from marketing in terms of those tiers, what kind of level of personalization and campaign types we could do. So created some examples of what engagement plans might look like for the different tiers, but it’s evolved quite a bit since then, as the new kind of sales came in and as we hit some bumps in the road, I think which is to be expected when you’re talking about such a dramatic change in the way you market. Yeah, I think it’s a little bit of both end there I think, just evolving. How do you realize when a plan isn’t working for your organization? I find sometimes companies that have a culture of like, “Oh, yeah, we’re going to pivot,” sometimes the longer you do that, it’s like, “Okay, now nothing sticking,” so it’s a double-edged sword. Amanda: You hit in on the head. I think that’s a cultural question, and different organizations coming from the enterprise where you stick with a plan until you’ve exhausted it and realized 18 months later, this is not working. Versus the startup mindset where you could be pivoting and spinning all the time, and never actually landing on any real work that can get done and executed because you’ve changed your strategy so much. So trying to strike that balances is critical. Don’t be so wedded to your idea that you’re not willing to fail and make changes, but simultaneously stick to your guns. If you think that the strategy is right, maybe you just need to stick with it a little bit longer to see it to fruition. Andrea: Yeah, I love that. I think of it in the way, I actually love your analogy of the walls for that. That’s one of the ways that I try to balance it. Hit my microphone, but that’s one of the ways that I try to balance it is to say, what do we all feel comfortable with, in terms of a timeframe because it’s the same thing as even just a very simple tactical example of, you send an email to 100 people, none of them respond, but it’s only 100 people. It’s probably not a big enough sample, you didn’t give it a chance, right? Andrea: I love that idea of continuing that walls concept and making sure that you have parameters and some maybe science even behind that. When is a team ready to start campaigning? Andrea: That’s great. Then, we pick our TAM, and then, to your point, there are lots of different ways that sales teams can pick their actual targets, and then we start our campaigning right then? Amanda: Well, yeah, that’s I think, the mistake. Amanda: I think that’s where the mistake is. Because the target accounts are really just the beginning and the next step from my perspective is looking at campaign architecture first, and this is the walls, this is the analogy of the walls. What I realized very quickly is that the target accounts were not all equal and it’s not just in terms of their size and revenue potential that is a good starting point, but some reps may choose a target account because that’s somebody that they already have active in the pipeline and they really want help closing it. Where other reps may choose target accounts that are all prospects that they just look at the target account list as a way to get marketing to help prospect with them. So, that creates a level of disparity when you start looking at reporting at a target account level by tier, if you’ve got a dozen accounts that are mid-funnel that are you’re working on trying to speed up the opportunity and improve, accelerate the velocity of the opportunity, where others, you’re very much just trying to break in the door and prospect. That, it almost creates this matrix effect with the target account list where you’re not able to just look at it by tier, because the tier will help you with how much personalization and how much investment you want to make in terms of monetization and resource allocation. The flip side of that is that all of those accounts can be in very different places in their buyer’s journey, so one campaign is not the same as another campaign. So, how do you report on that more matrix view? Also, how do you structure that more matrix view of it, which is more of, I look at them more as campaign streams than as rigid campaigns? Think of the tier one prospecting stream should look like this knowing that it’s more of a cadence that will be intersected by hard and fast things like conferences, or date parameters, like Halloween campaign, or a Valentine campaign. I’m in a CPG space so food is a big deal for us. That approach to think about it strategically, and not just right into, okay, this is what’s happening at the at this account, let’s sales rep, let’s send them an email and let’s try to send them a gift basket because we know this person is really interested in this topic and or a book on this topic, or a piece of content marketing that’s tailored just to them. I think, not establishing that wall architecture. We know that we’re going to have these campaigns by tiers, but beyond that, then we just jump right to the bricks, then you lose that understanding and that ultimately ties into reporting accuracy. Because if you’re looking at target account penetration by tier, that’s a fallacy if accounts are coming and going all the time and accounts are at different levels of engagement within their tier. Andrea: Yeah, I think that’s really smart. I love the beginning of your statement where it’s really about the salesperson psychology. If you’re going to let them choose their targets, and they don’t all have the same mentality, then the rest of the stuff that happens downstream is going to be affected by that core thing. I think that’s really interesting. I’ve never thought about that before. Amanda: A lot of accounts and a lot of a sense that, “Okay, they sent us 100 accounts that they’re really trying to work hard, and we do some special love for them, and we’d measure it and it was great. Amanda: Running a pure ABM play is very different than that and there are a lot of learnings along the way, and I would say that’s probably one of the biggest. Andrea: Yeah. Yeah, I love that. I have another question, and I’m not sure that it’s valid, because I don’t know that I completely understand. So, but we’ll see when I ask it. How do sales reps even know what to say? Andrea: I think what you said is that the organization was selling one type of product to a different kind of company and when you came on board, they were starting to sell to the Fortune 500. That was just in my mind, I immediately was like, how do sales reps even know what to say? Because that buying process is so different to your point even the idea of having GE. GE is not a company, GE is thousands of companies, right? Andrea: I think even just that concept of, at what point do you actually do like the buyer research? Educate your sales team, educate your marketing team, educate everyone in the organization about, “Hey, our customers like fundamentally changing.” It might have the same, the person might have the same title but the way that a deal gets done is so different. Is that a valid question? Like how does this happen? Amanda: I do think that’s a valid question. It’s one that the organization wrestled with, and I’ve got to give them a lot of credit for that. Bringing in some consultants who had some expertise on that area to help advise hiring some additional sales force that came from a CPG space that could help educate internally, but then in terms of the enterprise selling, which I think it goes even above and beyond that, investing in sales methodology and sales training, because a lot of startups, especially with a small sales team don’t necessarily have formal sales process and sales training. I think in our case at OneSpace it was the Sandler methodology that they rolled out, and there’s a ton of different methods out there. I think I probably doubled in three or four of them in my time at my previous company. Just having that formal support to help everyone acknowledge this is different, this is not going to be the same, and I still think it’s a learning curve for the organization in that way. How did you get familiar with the buyers? Andrea: Yeah, and how did you get familiar with the buyers? Amanda: Events have been extremely helpful. We have some thought leaders who write a lot of our content for our blog, and I was very fortunate to have a content writer on the team who’s amazing and talk about a rock star storyteller. She’s really, really strong and so I think having that connection to the content that we’re producing that I didn’t really even understand when I first started, has been really helpful. The other piece is just tons of industry newsletters, listening to webinars, researching the competition and the different pieces that they’re doing, but also establishing some partnerships with other companies that are in our industry. It’s also been an amazing opportunity to have to feed my intellectual curiosity and to help grow and be a rapid learner as fast as I can about the space. I still have a ton to learn, but I do feel like I’m getting a grasp on that customer, and their desires a lot more so than my first 30 days. Andrea: Yeah, and so you mentioned just partners. I think there’s two huge areas of marketing that barely anyone talks about and one is partnerships. I feel like there are some companies that their businesses don’t exist without partners and then there’s a whole larger subset that really doesn’t leverage them as much as you could and grow extremely fast if you leverage partners intelligently. I’m not sure if you have any brilliant insights into to leveraging partners, but I just love that you mentioned it as part of our learning track. Because I totally agree. Partners, even when I think about Lead MD as a consulting firm, the level of product knowledge that we have for Marketo, if people at Marketo just talked to us more, they would. They know so much more because we frankly have been working with Marketo longer than most people that work at Marketo, right? Andrea: I just love that you brought up partners. Amanda: It is an area that I had some experience after as many years as I had. I’m aging myself so badly by saying it that way, but it’s true, that I’d had quite a bit of experience working with relationship building with partnerships. That was a positive thing in my past life, but it’s one that I’ve been able to leverage here as well, and I do think that the partnerships that we’ve established have been extremely powerful for us. Partnerships for all marketers are a great way to hack just like you described. You can growth hack so fast that way, not just by scaling from your resources. I mean, putting on shared events, collaborating on thought leadership and content together, there’s just a lot of opportunity if you can be friends and play nice in the sandbox with somebody else that’s in your space. That is a key part of the marketing strategy that I have going forward. Andrea: Yeah, and I think the other big thing is just, it is the sales, right? If you’re going to look at one of your metrics being how well are you engaging at target accounts, if you have a partner who’s already engaged over there it’s to your point, an immediate hack, because all you have to do is have that person invite their customer to an event that you are co-hosting and you get exposure. Amanda: And your acquisition costs significantly dropped. From the marketing attribution side, when you’re looking at ROI, if you’re hosting an event all by yourself, not only do you have the fully loaded cost of that event, you have your team in that fully loaded cost. If you can share that with another company or another partnership, it really does, not only speed up the sales cycle and accelerate that, but it also helps with your acquisition costs. It’s really a win, win. Andrea: Yeah. All right, so you mentioned reporting? Andrea: Tricky, tricky little question. Amanda: Tricky little devil it is, isn’t it? Andrea: Yes, so do you have any hard results for these ABM efforts? Amanda: Well, yes and no. Part of the yes is that we’re seeing a lot of success with a more formalized event strategy that’s targeting those target accounts. This is where I was getting at earlier when I said ABM in a lot of ways, it’s just marketing. That you’re just marketing to a smaller subset of people, your segmentation strategy is more narrowly defined. We are seeing a lot of success with our events, especially in this space, because e-commerce marketers are they’re a tribe. They really rally around each other, they know they’re in a growth area, that they’re in an up and coming, fast-moving space, and so that the events that they attend a really powerful learning opportunities for them and we’re fortunate any organization I’m in to have a thought leader in that space as well. That’s been a really powerful opportunity for this business, and so we are seeing a lot of really good results from that. I think, from the outbound and from the ABM structure, we still have a lot we need to do in terms of executing campaigns at scale. A lot of the work just to small little plug for Lead MD. A lot of the work that you guys are doing is, is ultimately helping us build that infrastructure so that we can execute campaigns more quickly, and also report on them in a much more seamless fashion so that we’re not manually pulling data from multiple sources. Marketo, Bizible, Salesforce, those tools together we ultimately are shaping them in a way that we can get better results. Amanda: I will, if you don’t mind, I will jump in on one other thing too. Andrea: You work for a really data forward company and we’re consultants, we love data, it’s important, it’s great. What role if any, do you feel that gut still has? I assume you’re a veteran, and maybe it’s just me. I don’t know, but most of the marketers that I talked to who’ve been around a long time, they know what’s working and what’s not instinctively and I think that’s maybe part of the problem with getting people to commit to all of the little nuances that are required in order to actually report on marketing’s impact, but that I digress. Amanda: Yeah, no, I think that’s a really good question. Something that’s been on my mind a lot. It’s interesting that in my enterprise role, I was the one bringing data to the table for the first time, it was all marketing by instinct. I think there was a PowerPoint slide that was used in a management deck that referenced management consensus or something as the rationale for doing it. They were right to do that, I’m not questioning them. I think that was very valid. They made the right decisions, but there wasn’t a lot of data in B2B marketing, and so at the time, I know that a lot of my subordinates were really freaking out because I kept saying, “Okay, show me how that’s measurable. How is that measurable? What’s the end goal and how is it measurable?” I think I was a broken record for probably two years. I think that’s probably true of a lot of marketing organizations that were going through that transformation as we had rolled out Demand Gen and really fully implemented Marketo for the first time and had full funnel reporting and insight into where we were in the pipeline. I was on there really like I’m a data nerd in the last role and I think now I’m in a role that it’s a very data-driven organization, and it’s also one that’s trying to move very, very fast. Sometimes it takes time to gather really, really rich, meaningful data and to build a beautiful dashboard. That’s time that gets taken away from doing really great beautiful campaigning when you have a small team and small resources. It is a balancing act. It’s one where I think you can easily fall into analysis paralysis, and you can spend so much time measuring that you aren’t truly able to tell a good story and to execute that because you just don’t have enough resources. I do think that data is the foundation of how you make smart decisions. I like to think of it as informed decision making and not necessarily data-driven decision making. Because the data points can tell a story, but they can tell a lot of stories and ultimately if the sky is blue, sometimes you just have to say the sky is blue and move on. I think that this organization does a really good job of balancing that and others I know have struggled in that world where they’re just so data wired down and wanting data points that they can’t really just be confident. I’ve got a small team, it’s going to take time to measure this, let’s just move on and we can, we’ve got just a few accounts, let’s see anecdotally if it works or not. Andrea: Yeah, I love that. We experienced that too. I was on a call the other day about the level of granularity to take when looking at investment, the I in ROI, and you can make yourself crazy if you think about it, but really like too much. Like okay, so everything, let’s take the cost of a platform like Marketo, where does that fit in? How do I split that among all of my channels that are leveraging Marketo, and where do you start and stop in that conversation? Because then it quickly spirals into things like, well, what about your hosting? Whose line item is that? Is that IT’s line item, is that my line item? Then I have to incorporate every web form I have into penny that is going towards hosting, and website maintenance, and things like that. Andrea: Are we getting people saying, “Hey, yeah, I saw you guys on Twitter the other day.” Just anecdotal stuff that I feel fills in all of those little gaps. Amanda: A little story is enough. Amanda: When you’re in a small agile company, perfection is the enemy of productivity. If I hit 80%, I know it’s a B, but that’s okay sometimes to have a B. Then maybe a really good A in the mix, but you’re able to execute much more quickly if you’re not necessarily shooting for perfection every time. Those kinds of ways to fill in those gaps are perfectly acceptable. A colleague of mine talks about it like overworking the dough. You can really spend a lot of time making sure every message is perfect that you send, that you can make sure that everything that you do is beautifully executed, but you’ll probably only achieve four or five of those at a time and then from there you could have executed maybe 20, if you had just said, “This is, this looks … It’s okay, let’s go let’s see what the results are and then we can iterate it on next pass and make it better next time. Andrea: Yeah, I totally agree. Amanda: We don’t think of marketing as MVP. We talk about it all the time. That’s where that agile marketing philosophy could be really interesting to roll out, and I’ve explored that a little bit in the past. Thinking of marketing as MVP, we don’t always do that, and part of it is that the profession’s so subjective. I mean, the data is not necessary, although some would argue it is, but the creative is definitely subjective. Andrea: All right, and so we’ve talked a lot about this SaaS company you work for, One Space. Where do we learn more about what you guys do and what you’re up to? Amanda: Sure, so OneSpace is a combination of both a platform and a marketing, digital marketing company. You can learn more about us at onespace.com and definitely encourage you to read the blog. There’s a lot of really great content on CPG’s there. Andrea: Yeah, you’re helping people understand your market. Look at that, great content marketing. Thank you so much for joining us, Amanda. You were fantastic. I learned a lot and you have great tips. Andrea: We’ll put this on our blog, and we’ll set all of those great little tidbits for those marketers who are too busy to listen to this whole damn thing and it’ll be great. Thank you again.